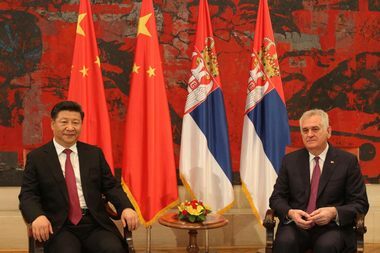 Belgrade, June 18, 2016 – Serbian President Tomislav Nikolic said today after talks with President of the People’s Republic of China Xi Jinping that China is a strong pillar of support for our country and conveyed the readiness of Serbia to economic co-operation to obtain a new, much stronger dimension. The President said that the friendship between Serbia and China does not measure measure time, close geographical location, the identity of culture and tradition, or the volume of trade, but that it is based on closeness in spirit, respect for universal moral principles, the struggle for freedom and justice. We both want the same rules that apply to all nations, and to allow each country to develop its potentials and advantages, without conditions, blackmail and threats, said Nikolić. He pointed out that it was unequivocally clear to the President of China to Serbia will continue consistently to support the policy of one China and principled policy aimed at cooperation and peaceful resolution of all issues through dialogue. Serbia is ready to become the most important partner of China, and not only in the region, Nikolic said, adding that because of this, our country has offered to China Center for Cooperation China Cieza be established in Belgrade. According to him, Serbia has special significance modernization of the Belgrade-Budimešta, as well as other projects of transport networks on land, maritime and river route between China and Europe because it is a chance for development across the region and a significant step forward in terms of economic cooperation. President of China Xi Jinping said that visits to Serbia and signed agreements relations between the two countries set to a higher level, adding that Serbia is for China a sincere friend and reliable partner. The importance of cooperation and friendship with Serbia speaks, he added, the fact that Serbia is the first country in the region with which China concluded a strategic partnership agreement. He pointed out that the idea that at least once a year the presidents of the two countries meet in order to deepen mutual relations concerning different aspects of the overall and thus expand cooperation in the military and all other plans. You said that the relations between the two countries aspiring to continuously grow and deepen. There is a historical confirmation of these relations. China wants to continue to deepen friendly relations with Serbia and that the two countries continue to be reliable partners, he added. You said that it was very happy that the visit to Serbia last in a nice organization and reception of the Serbian side. This is one step in the deepening of relations between the two countries and I want to express my deepest respect, said the Chinese president, stating that the Serbian history and culture of debt and all the people of China left a very deep impression. President Nikolić was handed to the President of China Order of the Republic of Serbia on a large necklace, because, as stated in the reasoning of the decree passed on 12 May decoration, exceptional merits in the development and strengthening of peaceful cooperation and friendly relations between the Republic of Serbia and the People’s Republic of China. In the Palace of Serbia held a meeting of government delegations of Serbia and China, led by Presidents Xi Jinping and Tomislav Nikolić. Nikolić said on that occasion that Serbia China prima open heart, wishing that all jobs done on both sides. He pointed out that, with the current economic cooperation and investment in infrastructure, the entry of Chinese in steelworks in Smederevo business move that will for eternity consolidate economic relations between the two countries. The Serbian president before the beginning of the tet-a-tet meeting, said that Serbia and China are reliable partners and friendly countries, and pointed out that from that date certainly arise and new economic relations. He stressed that Serbia does not need any other assistance, except those which will allow it to start work, expressing her hope that China will be helpful in that it would result in a joint conquest of new markets. 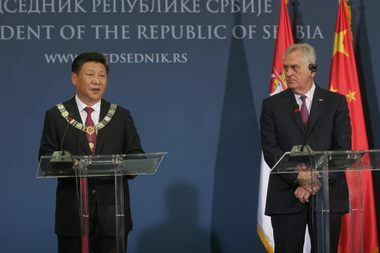 Nikolić said that the arrival of the Chinese president to Serbia considers the realization of his life’s dream to link the peoples of China and Serbia, in order to enable everyone to a better life, stressing that the role of the Chinese President in this exceptional role. President Xi Jinping said that the relations between China and Serbia deep and meaningful and that they are not only celebrating the friendship and cooperation, but also common values, and that China is ready to raise the level of these relations. We are ready to make efforts to strengthen the traditional friendship between the two countries that have established our older generation. We are ready to work together with you and continue to raise the level of friendly relations, he said.